Timaru blacksmith Bob Fitzsimmons won the first New Zealand boxing championships in 1880 and successfully defended his title the following year. Fitzsimmons became a professional boxer and fought for years in Australia before heading to the United States in 1890. There, he won world titles in the middleweight, heavyweight and light-heavyweight divisions, and was the first boxer in the world to win world titles at three weights. Fitzsimmons stands with the great figures of world boxing history. 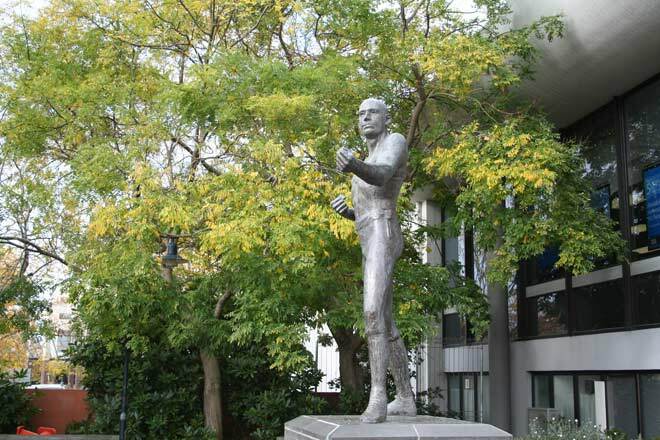 This statue, near the corner of Stafford and Strathallan streets in Timaru, was commissioned by businessman and boxing enthusiast Bob Jones and sculpted by Margriet Windhausen. It was unveiled in 1987, not long before the 70th anniversary of Fitzsimmons' death in the US.